Seems I’m always looking to recreate the past or something – yesterday afternoon, while digging through listings for a completely different car, I stumbled upon a car from my past. 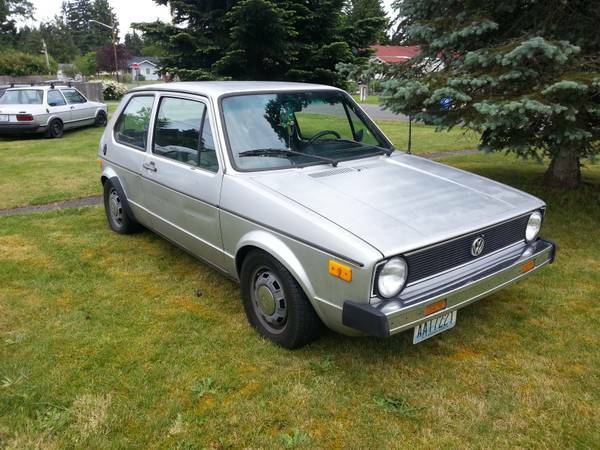 Ordinarily, I would curse the advertiser for using misleading keywords on their listing, but in this case, it’s a 1978 VW Rabbit C, which is very close to the 1980 VW Rabbit L on which I learned to drive. In a way, it’s quite surprising how rare these have become, given their historical significance. However, they were cheap drivers for most people (including my parents), so most rusted to pieces or cost more to repair than they were worth. Fortunately, that fate didn’t befall this car, a 1978 model in the most basic “C” trim level, available in Tacoma, WA for $2000. Well here’s something you don’t see everyday. Unless you were me a couple of years ago – I owned a 1978 sedan from from 2008 to 2011. And while it was a nice car on one level – sort of an old Italian man’s car, or an Italian version of a Volvo or Mercedes – it was painful to repair and woefully underpowered for a sedan of its size and displacement. Certainly, one of those issues could have been eliminated if it weren’t for the fact the car needed to be smog legal – a popular conversion is to mount twin carbs, which is supposed to give over 100hp. With the 5-speed, that would surely give more competitive performance. Find this conversion-ready example for $2500 in Bellevue, near Seattle, WA.